The IonCleanse® Solo™ is the latest ionic foot bath created by A Major Difference, Inc. Now available for home use, the Solo™ allows individuals and families the opportunity to experience the IonCleanse® process without the heavy initial investment. Is like Setting three on the Premier. Read the Brochure for a detailed comparision of machines. Includes: Plastic Footbath with Lid, Box of Liners, Sea Salt, Electrolytes, Disinfectant, Ascorbic Acid & Carrying Case, Array with Plate, 1 Year Warranty, 1 Program Setting (Like Setting 3 on the Premier). 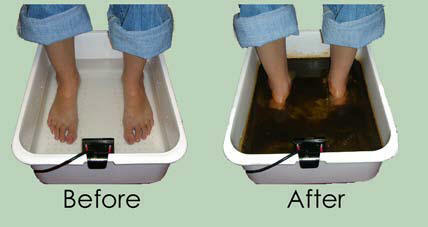 The Ion Cleanse® Footbath purifies the body through the electrolysis of the water. Relax with your feet in water for about 30 minutes. Healthy individuals can expect to feel lighter and experience a greater sense of well being from each IonCleanse® session. Dual Polarity The IonCleanse® has the ability to switch from a positive polarity to a negative polarity and vise versa. Our patented array configuration is the only one of its kind to produce both positive and negative ions in the water. AC electricity is converted to low power DC electricity which flows through a patented electrode system that sits in the footbath. The electricity and the metal combine to split the water molecule into H+ and OH- ions. These ions travel through the body, neutralize oppositely charged particles and through powerful osmotic pressure pull those neutralized particles out of the body through whatever skin surface is in contact with the water. An ion is a charged atom that has gained or lost an electron which creates a magnetic field capable of attaching to and neutralizing oppositely charged particles. These neutralized particles are extracted from the body through the process called osmosis. Osmosis is a scientific term that is used to describe the movement of particles through a membrane from an area of lower concentration to an area of higher concentration. In this case, the higher concentration refers to the ion field that is set up by placing the array into the water while running the unit. The array is placed into the water alongside the hands, feet, or body while the power supply delivers a low level direct current to the array. This causes the metals within the array in combination with water and salt to generate positively and negatively charged ions by separating oxygen and hydrogen in the water. The practitioner determines the polarity setting through the use of litmus paper (pH strips) or muscle testing. The long-term effectiveness of the IonCleanse® cleansing process depends on other life-enhancing changes a person is willing to make. The IonCleanse® has the ability to switch from a positive polarity to a negative polarity and vise versa. Choose your Plates: Two different types of plates 316 Regular/304/321 Heavy Duty. With each IonCleanse® purchase, the customer has the option to select between our standard 316 plates (30 Minute) and arrays, or the more powerful 304/321 (20 Minute) combination plates and arrays. Replacement plates last around 40 footbath sessions Save 10% when ordering 6 plates or more. The IonCleanse® units are the only ionic foot baths on the market to have passed FCC (Federal Communications Commission) and CE (European Conformity) electrical safety standards. While several of our competitors claim to have the same approvals, our testing confirmed that none of the units passed all of the safety tests that the IonCleanse® Premier™ or Solo™ has. Cleansing and balancing your PH are two of the main keys to overall health. 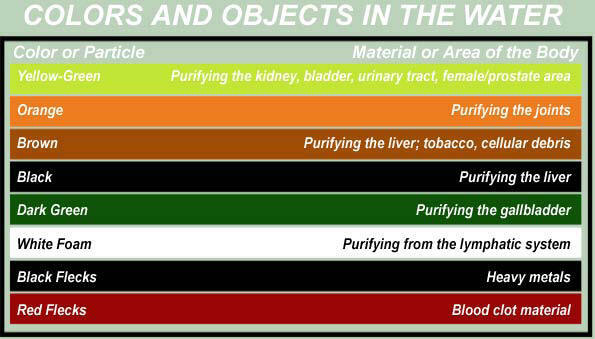 Toxins that enter the body turn to acid which leads to acidosis and disease. Beginning Symptoms of Acidosis include: fatigue, headaches, bloating, acne, constipation, food allergies, panic attacks, slow circulation and joint pain. Intermediate symptoms of acidosis include: asthma, bronchitis, insomnia, psoriasis, fungus, depression, cold sores. Advanced symptoms of acidosis include: cancer, fibromyalgia, weight gain, multiple sclerosis, arthritis, diabetes, lupus, leukemia, heart disease and migraines. over-acidification of the body is the single underlying cause of all disease. Dr. Young has found that when the body is in healthy alkaline balance, germs are unable to get a foothold. Free Report on PH Balance and Alkalete "Acidity the Silent Killer"
We have known since the early 1930’s, that in order for the body to function properly and to maintain optimum health, the general pH of the human system must be alkaline. Arthur C. Guyton, M.D., who is considered the world’s most recognized author on human physiology, has spent the better part of his life studying the pH or acid/alkaline balance to the body. In his “Textbook of Medical Physiology”, which is used to train medical students, he states, and I quote, “The first step in maintaining health is to alkalize the body. The second step is to increase the number of negative hydrogen ions. These are the two most important aspects of homeostasis.” Alkalinizing the body and increasing the number of negative ions is essential for creating a healthy terrain in the human body. Dr. Guyton found that when the number of negative hydrogen ions is increased, the number of electrons available for the body to use as antioxidants to repair free radical damage is also increased, allowing the body to heal quickly and to maintain a high level of health. Research by German and Japanese scientists has added to Dr. Warburg’s discovery. It can now be said that there seems to be no disease causing organism, including bacteria, virus, fungus, yeast, amoeboid, or cancerous cells, which can reproduce in a highly oxygenated, increased electron, alkaline environment. pH represents how acidic or alkaline something is. pH means the "potential for hydrogen." Scientists have found that healthy people have body fluids that are slightly alkaline, 7.1 to 7.5 pH. Your blood needs to be maintained at a pH at or near 7.4. In an unhealthy or life depleting acidic terrain, the body will rob bones of calcium which is very alkaline in order to get the alkaline calcium benefits to the blood because if the blood becomes acidic, you die. Scientists and doctors have also found that over 150 degenerative diseases are linked to acidity, including cancer, diabetes, arthritis, heart disease, gall and kidney stones, and many more. All diseases thrive in an acidic oxygen poor environment. This is why it is so important that we take actions to regulate our pH and create an alkaline environment in order for our bodies to function correctly. The summary of the results is outlined in a comparison chart below. Please click on the link to view a full screen version of the chart. Several of these companies claim to have CE, FCC, and UL approvals. Ask the manufacturers for a detailed copy of their safety reports (approximately 150 pages). If you have the extra money then don't waste it on the other cheaper models out there. This machine works and can't be compared to any other. Click the button below to add the Ion Cleanse Solo Footbath to your wish list.